Image caption The protesters gathered in front of Dresden's Frauenkirche (Church of Our Lady) to call for "cultural openness, humanity and dialogue in co-operation"
The turnout is nearly double that of the largest demonstration by anti-Islamists Pegida, held last Monday. Saturday's counter-demonstration observed a minute's silence for the 17 victims of this week's terrorist attacks in France. The next Pegida protest in Dresden will be held on Monday. Some analysts say that numbers may grow as a result of the violence in France. 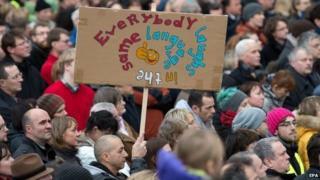 Demonstrators at the counter-rally on Saturday - which was jointly organised by the government of the state of Saxony and the city of Dresden - were joined by Saxony State Premier Stanislaw Tillich. "Thirty-five thousand people [have] attended this event, and they made clear that they love this city and that they're proud of this city, and that this is a tolerant and cosmopolitan city," he said. Likewise Dresden Mayor Helma Orosz urged supporters of Pegida (Patriotic Europeans against the Islamisation of the West) to change their minds and join the campaign against racism. "I believe that this is a clear sign that our society is standing together, and furthermore that we're not forgetting those who are afraid, those who might march with Pegida on Monday," she said. "We're not abandoning them, we're inviting them to come to us." Image caption Protesters at the counter-demonstration were invited to write messages on the "Wall of Love"
One unnamed protester told the BBC that the object of the demonstration was to make clear that Dresden was "a tolerant city open to anyone". Pegida has been condemned by many mainstream politicians and large counter-demonstrations have also been held in Berlin, Cologne and Stuttgart. Would you unfriend someone for their politics?